The 2 little girls came again for a visit. Chou Chou is very good-natured with children's actions that other dogs might mind -- that's why Chou is such a good therapy dog. Chou Chou and I go to after school programs with the other therapy dog teams. 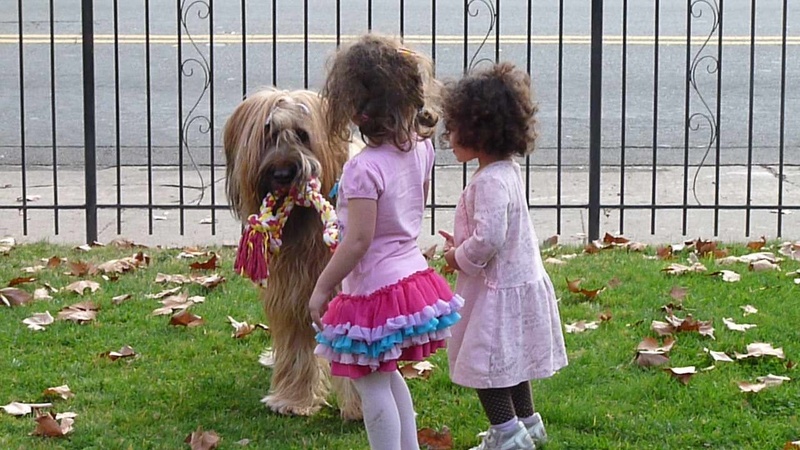 We each take a turn teaching children about dog body language: when it is safe to approach a dog and when it's not. So as the girls played with Chou Chou, we practiced teaching our after school safety tips, using Chou Chou as a good example. 1) It's okay to hug Chou Chou, but a lot of dogs don't like to be hugged. It feels confining to them. They do like to be pet on their head (gently!) or neck, and many like to have their ears or stomach rubbed. 2) You can touch Chou Chou while she's eating; she's trained so that I can even pick the bowl up or put my hands in it while she eats. But most dogs don't like being bothered when they are eating and feel possessive of their food; they may get aggressive. Best to leave a dog alone when he's eating! 3) Dogs, just like people, sometimes need "alone time." If a dog leaves the room after a lot of playing, let her leave and have a "time out," without following her from room to room. She'll come back to play in a few minutes. 4) Don't blow in a dog's face. Some dogs find that aggressive and may bite -- plus you don't want to put your face that close to a dog's face! Chou Chou was trained as a little puppy to be okay with blowing, but still, she doesn't really like it. 5) If a dog is sleeping, it's best not to bother him. You can plop on Chou Chou's big bed and she's fine with that, but many dogs are not. 6) If a dog's tail is tucked between his legs, he is scared. A fearful dog may bite, so best not to go near a dog with that body language. 8) If you see a dog sitting and looking at you with a wide, open mouth, but no teeth, and soft eyes, the dog is smiling. 9) Chou Chou is groomed almost every night. That includes checking between her paw pads for stickers. So she is used to having her feet touched and seems to like it. Many dogs do not like when people touch the underside of their paws (even if they willingly "high five."). 10) Some dogs you see out for a walk may be fearful of children, or in special training. Before you pet any dog, always ask the owner, "May I pet your dog?" Chou Chou Briard: Best Therapy Dog Ever!